Portion control eating utensils can be a huge help if you need to watch what you eat. They are also a great way to teach nutrition to children. Designed to help you to see the correct portions that you should be eating, these products are a wonderful aid for dieters and diabetics to control how much they eat at each meal. If you fit any of these categories, you will find the following article helpful and informative. Another way to be aware of what you are eating is to use portion control eating utensils. These utensils make portion control a breeze by giving you a tangible way to see exactly how much is in a typical serving of food. The easiest way to try portion control eating utensils is to buy a three-compartment plate. Normally these are sold as children's plates so a child's foods do not touch. 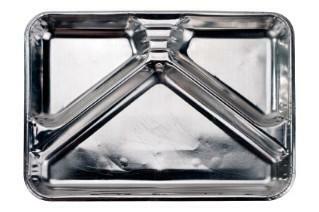 You can also buy a package of disposable plates that are divided into three compartments. These are commonly used for cook-outs and picnics. Fill the large compartment with fresh fruit or vegetables. Fill one of the small compartments with a protein like turkey, eggs or tofu. Fill the remaining compartment with a starch like bread, pasta, rice or potatoes. When you sit down to eat your meal, eat the foods in the same order that the compartments were filled in. This way you fill up on the healthiest foods first. If you like, you can add a salad on the side along with a low calorie drink or, even better, a glass of water. Portion control bowls are designed in pre-measured sizes. Some are decorated subtly to indicate how much each bowl holds. Not only are these bowls great for portion control if you are dieting, they are also nice as snack bowls for the kids so they won't polish off an entire bag of pretzels in one sitting.One brand of portion control bowls is the Yum Yum Dish. The Yum Yum Dish was designed by a mom who realized that her tendency for over snacking had caused her to gain more weight than she wanted. She created Yum Yum Dishes to hold four ounces of your favorite snack. No refills allowed! The Yum Yum Dish comes as a set of four with one each in green, red, blue and yellow. These hand painted, ceramic bowls are $22 for the four piece set. Another brand of portion control bowls is Mesu Bowls by Studio Panepinto. The set of six white porcelain bowls nest together for easy storage. Pretty pastel designs tell you how much each bowl holds from one half cup up to two cups. Sold as a six piece set, Mesu Bowls retail for $49.95. Individual bowls can be purchased for $16.95. You can choose from half cup, three quarter cup or one cup designs. The EZ Weight Plate was designed for diabetics or for people who want to lose weight by registered dietitian Laurie Acosta and registered nurse Lisa Becnel. For $19.95 you get a four-compartment plate with a lid. Both are microwave and dishwasher safe. You also receive a sample meal chart and a formula to assist you in calculating your caloric needs. Another idea is to try restaurant supply companies. They sell portion control utensils used for cooking and serving your food. This helps you know how much you are putting on your plate without needing to weigh or measure the food. For example, by using a portion control ladle for soups you will know that one ladle contains five ounces. Or by using a portion control scoop, you know you are serving two ounces of mashed potatoes. Try Strategic Foodservice Equipment Solutions to get an idea of what is available to you. Make your eating plan easier by trying a few portion control eating utensils. You'll save valuable time in the kitchen by not measuring and weighing your foods. Then you'll have time for more important things, like time with your family.